Jushchenko opens The Ukrainian Museum in New York! Well…sort of. The new facility of The Ukrainian Museum opened its doors to the public for the first time on Sunday, April 3. There was a slim hope that the President of Ukraine, Viktor Yushchenko, who is currently visiting the United States, would drop in later this week to view the Museum's inaugural exhibition of the "20th century's leading and most innovative sculptors" - Ukrainian-born Alexander Archipenko. So far, that hasn't happened, and the tight shchedule announced in the press doesn't seem to leave any room for art appreciation by the President of Ukraine. Yet, oddly enough, the very first visitors that stepped into the Museum's pristine galleries were a couple with the last name "Jushchenko" - spelled with a "J" in English, but spelled exactly the same as the President's in his native Ukrainian. As it happens, when Mr. Yushchenko came to the U.S. on an earlier visit as a Deputy of the Verkhovna Rada, he telephoned the Jushchenko's in New York to see whether or not there was a family connection. The question was not resolved during that conversation, said Mrs. Jushchenko, who thought that it would be more conclusive to search for information about family members that may have emigrated by searching through local archives in Ukraine. Although the new Museum may not be graced by a visit from the Ukrainian president this time around, its triumphant debut in the City of New York is not going unnoticed. The first day brought in an unexpected large number of art lovers in addition to the loyal membership of this 29-year-old institution. 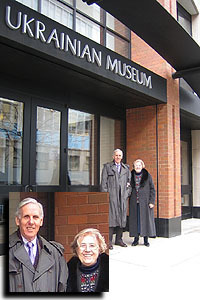 Visit The Ukrainian Museum online at www.ukrainianmuseum.org.